Celebrate the gift of life with this exclusive new series. 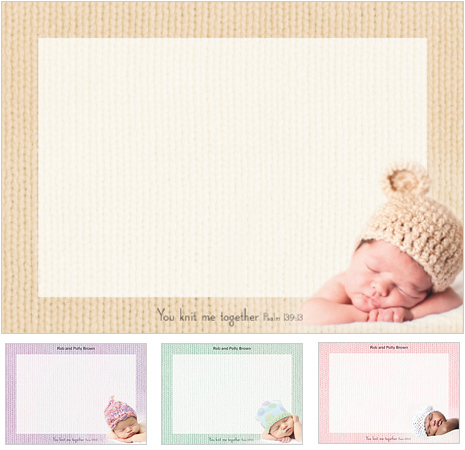 This precious bundle of cards features 4 rotating scenes of sleeping newborns on a delicate knit background. Each design is lovingly accented by Psalm 139:13 "You Knit Me Together". These 6 1/4" X 4 1/2" cards include free personalization and envelopes and are perfect for thank you notes, baby showers and announcements. Knit is a beautiful reminder that we are all fearfully and wonderfully made!